A low-carb protein bar that uses only high-quality proteins. This nutty bar is an almond lover’s dream-come-true, with a satisfying crunch in every bite. Mixed with vanilla, and packed with 20g protein and 5g net carbs* this Quest Bar is ready for adventure. Each bar is 60g. *7g Carbs - 2g Erythritol = 5g Net Carbs. Protein Blend ( Milk protein Isolate, Whey Protein Isolate (Milk)), Soluble Gluco Fibre, Almonds (24%), Water, Flavourings, Bulking Agents (Erythritol), Flavourings, Palm Oil, Sea Salt, Sweetener (Sucralose). 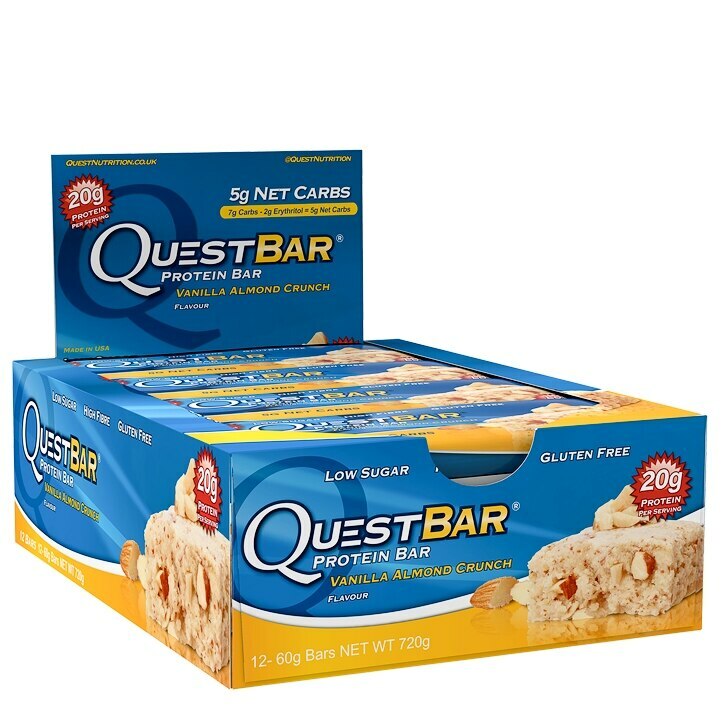 Quest Protein Bar Vanilla Almond Crunch is rated 3.5 out of 5 by 4. Rated 5 out of 5 by Dalep2k from Delicious One of the best tasting protein bars I've ever tried.